I took two off Hooper, and both had another tick feeding off it. Very weird. Hubby took one off of me Oct. 18th. Dead! Poor Val! 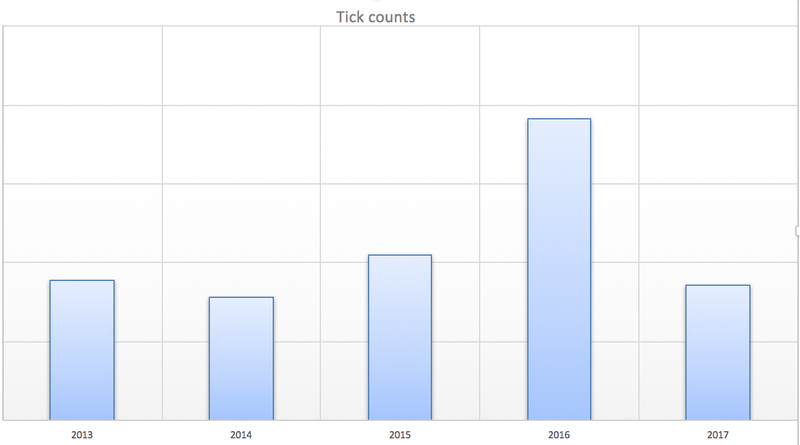 "279 and that is our lowest, too, but think the 200 this month was our worst month ever..."
Ticks are way down this year, 2017. 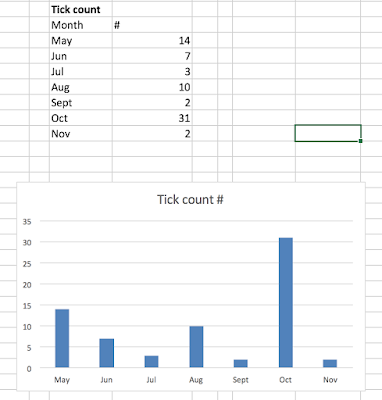 I've compared tick counts for May, June, and July, as of July 19th. I think the heat of May slowed them down, they are on the rise in October, however. It's perfect May weather. I'm wondering if it was due to the hot/cold temperature fluctuations we had in June? Poor Daisy is still bearing the brunt. Last year (2017), they invented Bravecto for cats and ticks. It works well. We did get a new product from the vet, which works for cats. This product just came out this spring. It seems to work really well. 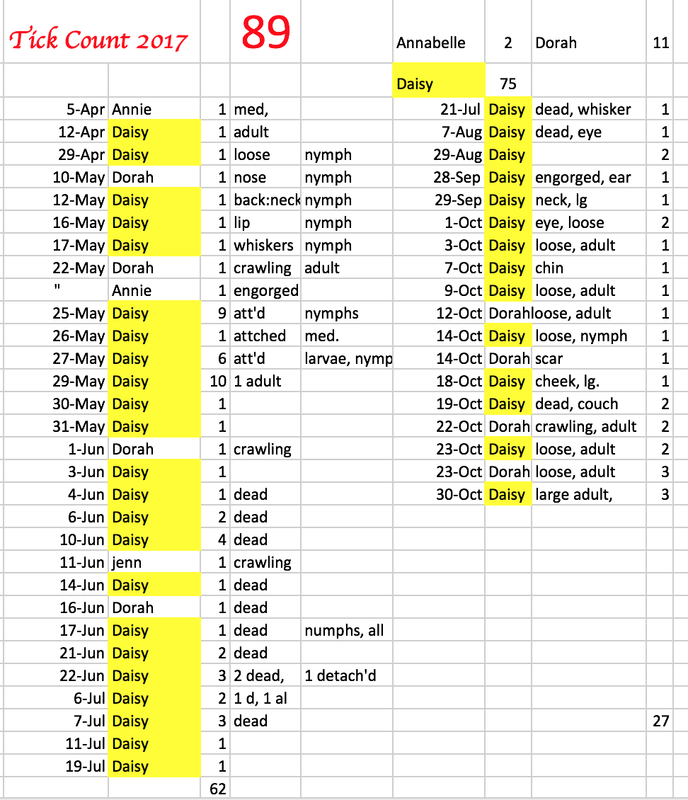 June 10th – took 4 dead ones off Daisy. It's called Bravecto. 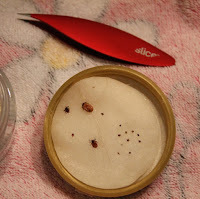 It doesn't prevent tick bites, but it kills fleas and ticks that have latched on. Daisy had 10 in one day! The government has issued a new framework. 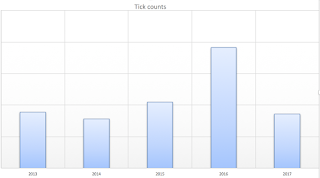 Surveillance: The establishment of a national medical surveillance program to use data collected by the Public Health Agency of Canada to properly track incidence rates and the associated economic costs of Lyme disease. 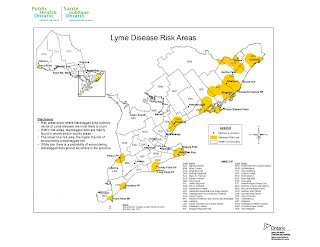 Education and Awareness: The creation and distribution of standardized educational materials related to Lyme disease, for use by any public health care provider within Canada, designed to increase national awareness about the disease and enhance its prevention, identification, treatment and management. Guidelines and Best Practices: The establishment of guidelines regarding the prevention, identification, treatment and management of Lyme disease, and the sharing of best practices throughout Canada. Daisy is ahead (65%, vs. Dorah's 29%)! Daisy sits on the grassy knoll! 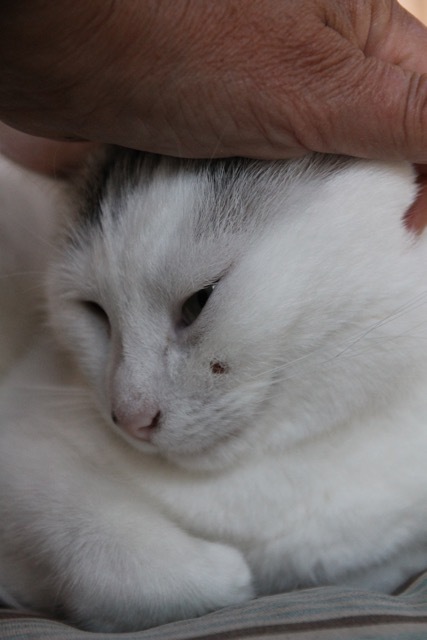 Hubby spotted one on Daisy, he grabbed a piece of tape, the tick burrowed into her fur, hiding from him. He persevered. At a meeting, we were told that 80% of Murphys Point Park ticks have the Lyme disease bacterium. Scott said 94 ticks, were collected in the Kenora area and tested and 41 %, tested positive. Not a large sample population. Scott studied include the pale beaver tick, the groundhog tick and, of course, the black-legged, or deer tick. He said the small arachnids used in the study were taken from animals including mice, dogs, hares and humans. 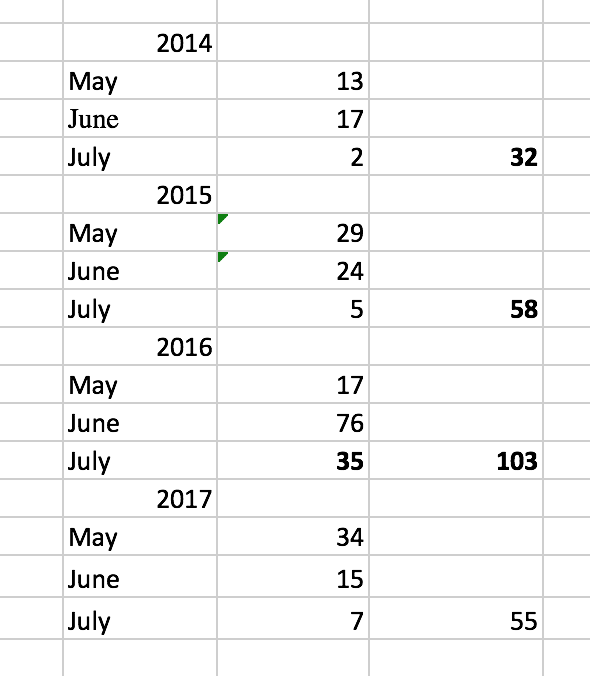 Incidents of Lyme Disease are down by 40% in southern Ontario (compared to the last 5 years), with the drought. Apparently, the nymphs are vulnerable to lack of moisture. 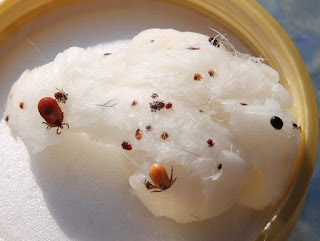 Most Lyme Disease victims are reported during summer when the small nymphs are difficult to detect. Most of the ticks we've harvested have been nymphs. They don't like extreme heat or sunlight, either. 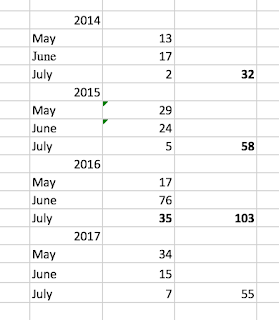 down from 46 in 2015. 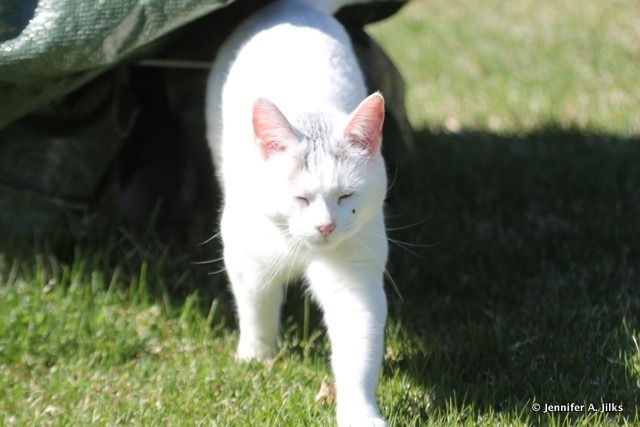 Sept. 26 – Chased a tick on Dorah for an hour. Got it! Piece of cellotape. Done. Two on Daisy. Annie earned only her third tick Oct. 4th. They are adults, now, and easily spotted on white cats! Mon., Sept. 26th: a gift. I looked down and there was an adult tick. Daisy had just visited me. I'm sure she brought it in. sigh. Thankfully, they've slowed down over the heat of the summer, picked back up in the cool of September. 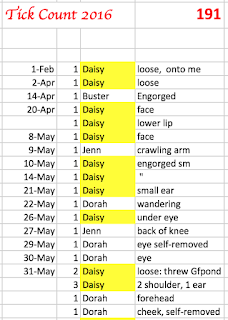 Daisy picked up 5 on September 3rd alone. She sits in the grasses and looks for mice friends. They continue to mature and bite here up until first frost, November. Up to this point, most of them have been nymphs (8 legs), with a few adults. The larvae have 6 legs. You can see the range in sizes in my photo. TickEncounter.org (U. of Rhode Isl.) offers an excellent ID guide. I reported my ticks, sent the photo. 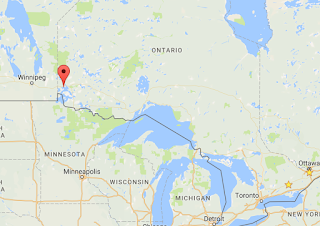 They don't cover Canada on their maps, however, and didn't add much information. 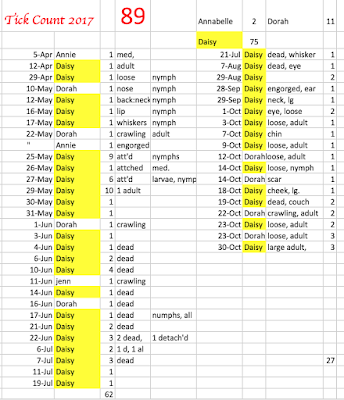 None of our ticks are on longer than a day. We check the cats twice a day. This pain and the itch are significant, and humans cannot miss them. Thanks for your TickSpotters report and for sending a picture. 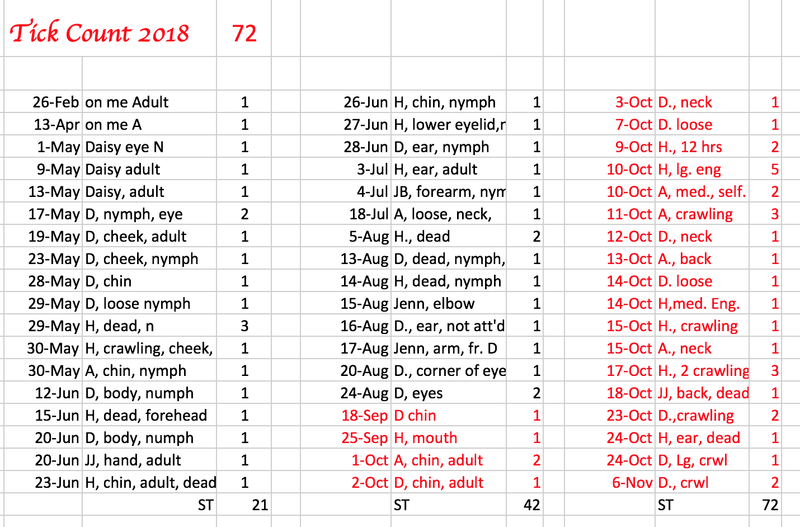 Yikes - that's quite a tick collection! It appears that you've encountered mostly adult female Blacklegged (deer) ticks. These look like they were attached and feeding for about 1-6 days or so (the two largest ones being the longest fed). 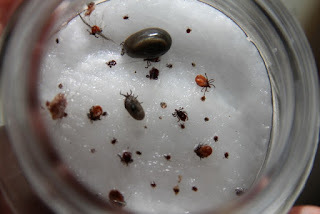 It also appears that there are nymphal blacklegged ticks mixed in there (the small grayish ones), and perhaps a few males (the small solid black ones). 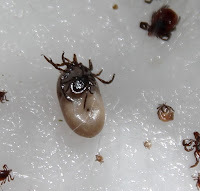 You might be interested in checking our hyperlink to see how much ticks can change their appearance the longer they're attached and feeding. Depending upon their stage, they vary in size. 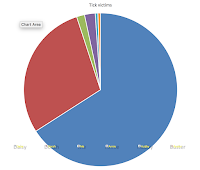 In the northeastern, mid-Atlantic and upper mid-western USA, about 50% of adult female deer ticks (and 15-30% of nymphal deer ticks) are carrying the Lyme disease bacteria. Somewhat less commonly, they also could be carrying the agents that cause babesiosis, anaplasmosis, miyamotoi relapsing fever, and an encephalitis-causing virus (more rarely). Transmission risk from an infected tick increases the longer they are attached and feeding. 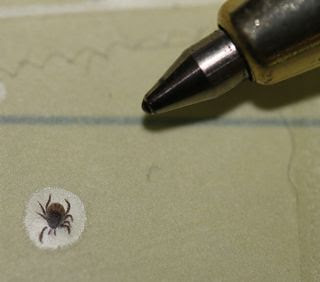 They offer tick testing, but only through US companies. I cannot see it doing much use for us. We can send our off to government agencies. We are simply vigilant in removing them. There are products, like Seresto, offered for cats to prevent ticks, but I cannot see putting a poisonous collar around their necks for 8 months. The cats seldom have a tick on them longer that a day. Most attach within two hours, and I check them twice a day. Canada’s Lyme testing methods are flawed. False negative test results are common, especially in the early stages of Lyme. The difference between a larvae, and a nymph and/or adult: Larvae 6 vs. nymph and adult have 8 legs! This is a great video, which shows the life cycle. They began, in 2016, in February. I can't believe it! Daisy brought it in on February 1st. I found it crawling over my arm after I pet her. Forest walkies with Daisy, a large adult crawling on her face. April 2nd. April 14th, as we were at the vet with Buster, I noticed a heavily engorged adult on his neck. 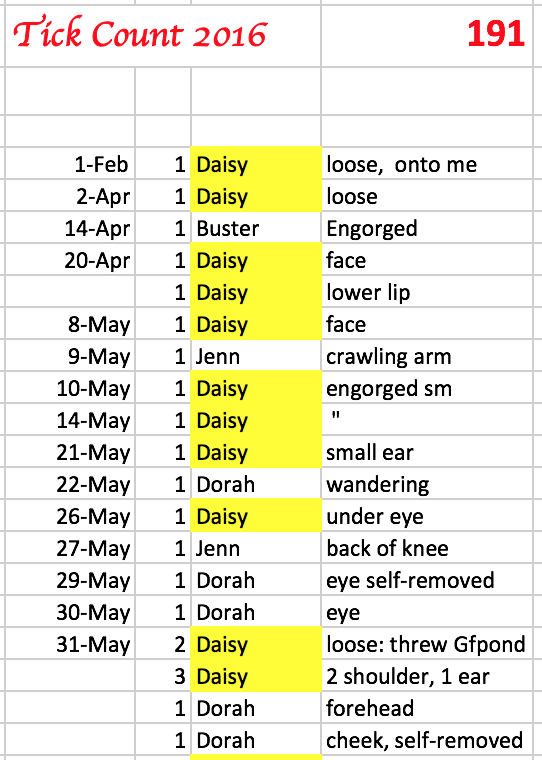 April 20, Daisy and I were walking looking for the owl. I could see it on her face. Later that night, Daisy was snuggling and I could see a tick nymph, embedded in her lower lip. Another on her face. I was out doing the lawn, long pants and sweatshirt pulled up to my elbows. Came back in and it was crawling on my arm. 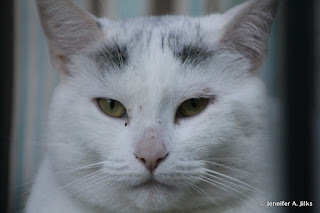 Daisy had a small one embedded in her face. Daisy had a teeny nymph on the outside of her ear. I had one embedded in the back of my knee. Hurt like stink, itched for days. 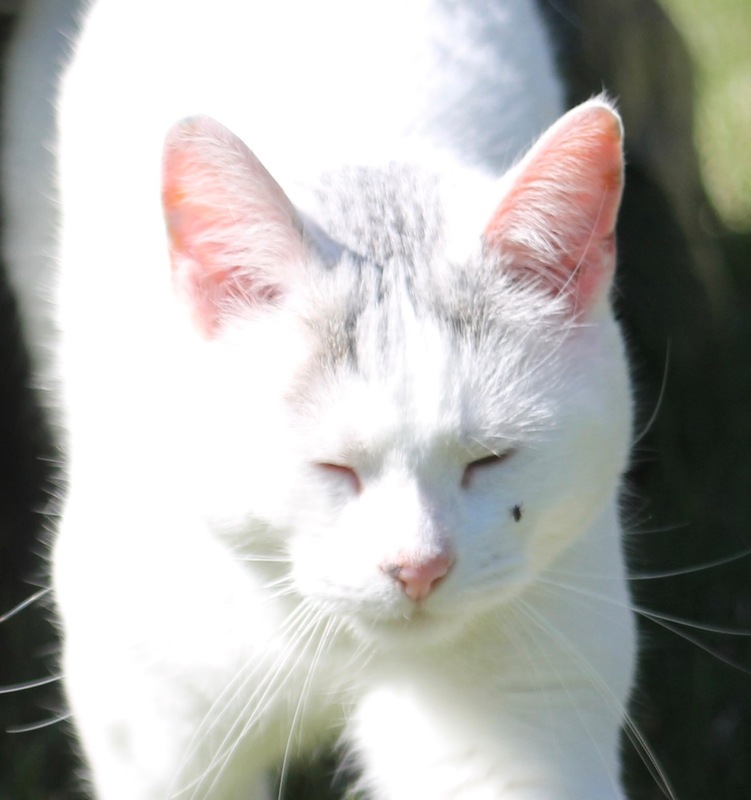 Dorah has a scar over her eye where she removed a tick. We took one off Dorah in the back deck. Daisy had two wandering around, one on her ear, one on her back. Annie: on her eye, June 8th. The twins continue to capture ticks, Annie doesn't often venture into the grasses, where the larvae are waiting for hosts. They have, for the most part, been larvae. June 14th was a big day. Dorah, sitting on the grassy knoll, captured 5 ticks, which I removed with great verbal protestations. I also removed one from hubby's arm. Little beggars got me again! June 27th. I removed it early, before it was engorged. 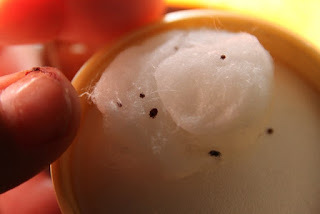 We pluck them off with tweezers, pop them onto a cotton ball soaked in rubbing alcohol. The larger adults are easier to find, the small nymphs are tiny specks. Canadians have begun to fight back against false negative diagnoses, and Chronic Lyme Disease. Polymerase chain reaction (PCR): While PCR is highly accurate when the Lyme DNA is detected, this test does produce many false negatives. This is because Lyme bacteria are sparse and may not be in the sample tested. Antigen tests: Antigen detection tests look for a unique Lyme protein in body fluids (e.g. blood, urine, joint fluid). People who test negative on other indirect tests may test positive on this test. “Western blot” is the most accurate antibody test. ELISA tests are not sensitive enough for screening, and miss the infection often. When talking to your doctor, request the Western blot test specifically. Lyme Disease Risk Areas in Ontario. 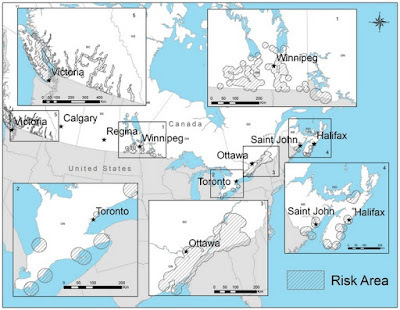 This map illustrates areas that have been reported as a risk potential for Lyme Disease in 2015. 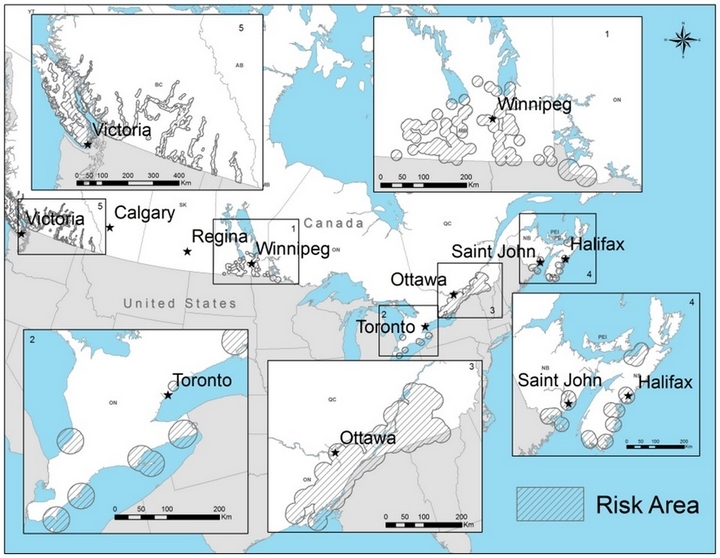 These risk areas were determined by a 20 kilometer radius from the the center of a location where a "Black-legged" Tick was found through drag sampling. It is also important to note that black-legged ticks will also feed on and be transported by migratory birds, so there is a low probability of encountering a black-legged tick almost anywhere in Ontario. Some families are having to fight for treatment, which is shameful on the part of medical staff. 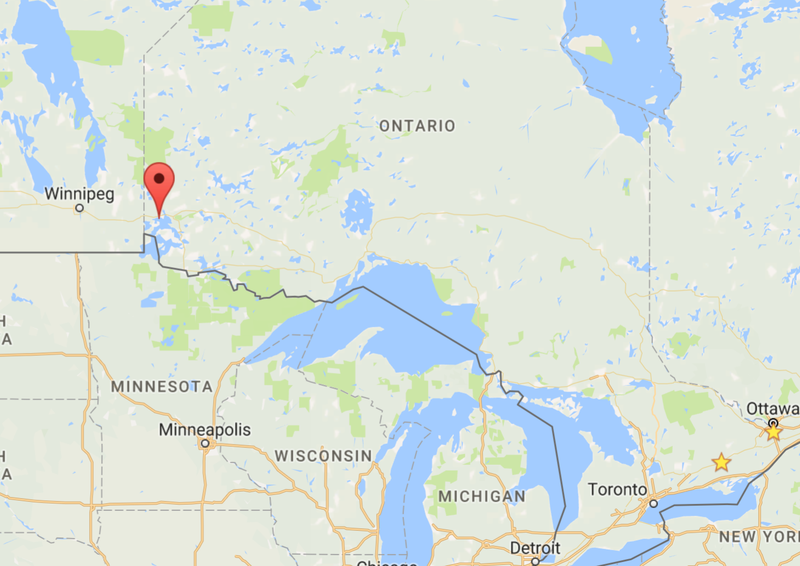 Chronic Lyme Disease, triggered by untreated, long-term Lyme Disease, is a big issue here in Canada. This blogger writes about the ignorance of her doctors. Ticks are tied to populations of white-tailed deer and rodents. As hunting declines and deer numbers increase in Canada, the large animals act as a greater reservoir for their ticks, Smith said. Deer are good at spreading blacklegged ticks but they generally don't carry it far, said Janet Sperling, a PhD candidate in entomology at the University of Alberta and a board member at CanLyme, which advocates for people with the disease. Some places, like Prince Edward County, have given up collecting data, as they know ticks are present! 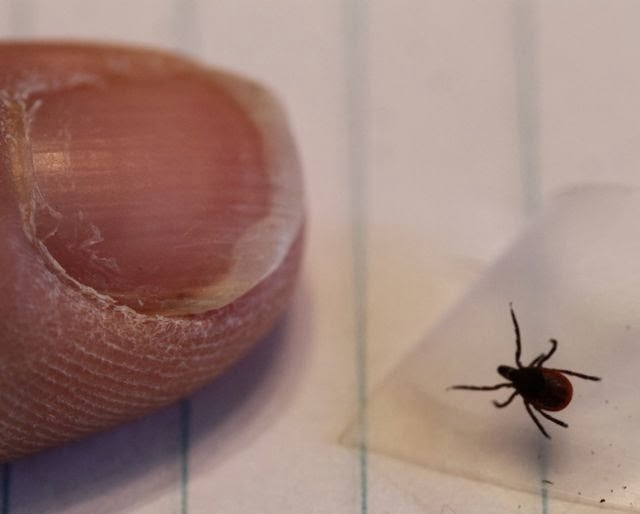 Officials said sufficient sampling has been done since 2012 confirming the presence of established black-legged tick populations, with a significant percentage with the lyme disease bacteria. Ticks everywhere from Jennifer Jilks on Vimeo.